The Tonic theme gives your site the responsive, flexible layout that everyone is looking for nowadays, but with a ton of style to help set your site apart. Many developers are designing sites that target mobile users specifically. Building responsive sites like these can be daunting for beginning web designers and developers. RapidWeaver and the Tonic theme take some of the headache of responsive design out of the picture. Tonic provides a clean, uncluttered layout for you to customize to your liking. Its design cuts out distractions and allows your visitors to focus on what is most important -- your content. This theme gives you tools like multiple ExtraContent areas and our Blog Entry Topper feature to help you design outside of the normal RapidWeaver constraints, letting you build a beautiful and functional site. The RapidWeaver app comes packed with lots of brilliant page styles built right in. 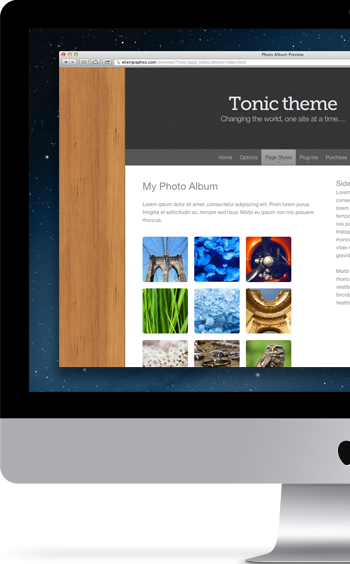 We style those page types beautifully with the Tonic theme and make them really shine. While RapidWeaver has some great page styles built-in, the third-party developer community for the app really produces some must have add ons that will take you site to the next level. The theme's product page contains an assortment of tutorial videos to help you get started and answer questions about the theme along with more info about the theme. New to RapidWeaver or just want to show off your RapidWeaver creation? Be sure to check out the great community in the RapidWeaver forums.